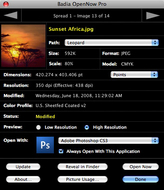 Extension for QuarkXPress and image applications. Is there a better alternative to Badia OpenNow Pro for QuarkXPress? Is Badia OpenNow Pro for QuarkXPress really the best app in Author Tools category? Will Badia OpenNow Pro for QuarkXPress work good on macOS 10.13.4? 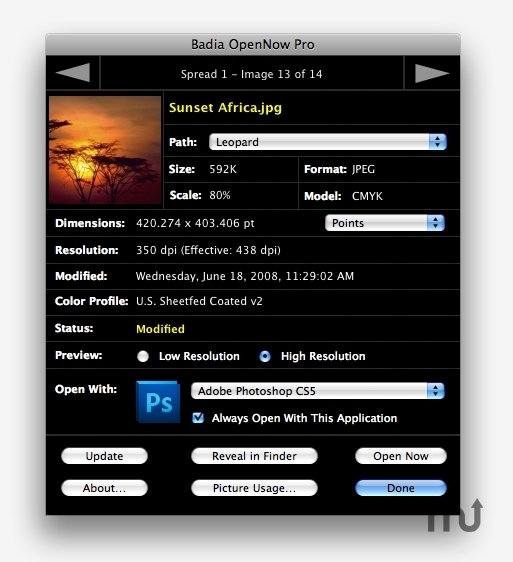 Badia OpenNow Pro is the perfect link between QuarkXPress and image applications. You can now open any document picture with the application you choose, and at the same time get detailed and comprehensive picture information. Double-click any picture to see all image settings, from color model to effective resolution to its full path, and select up to 30 favorite programs to open the picture in. Full compatibility with QuarkXPress 9. Badia OpenNow Pro for QuarkXPress needs a review. Be the first to review this app and get the discussion started! Badia OpenNow Pro for QuarkXPress needs a rating. Be the first to rate this app and get the discussion started!